There is a rise in genetic disorders such as cancer and other congenital disability globally. Also, the infectious diseases caused by pathogens such as bacteria, viruses, and fungi are on the rise. Such incidences are pushing many researchers and scientists to opt molecular biology enzymes, kits, and reagents for diagnosis for various infections. The increased focus toward molecular biology among researchers can be attributed to its high impact on diagnosing and treating diseases using gene therapy and gene recombinant vaccines. The high prevalence of chronic and infectious diseases is one of the key drivers contributing to the growth of the global molecular biology enzymes, kits, and reagents market during the forecast period. This market research report on the global molecular biology enzymes, kits, and reagents market 2019-2023 also provides an analysis of the most critical trends expected to impact the market outlook during the forecast period. Technavio classifies an emerging trend as a significant factor that has the potential to significantly impact the market and contribute to its growth or decline. 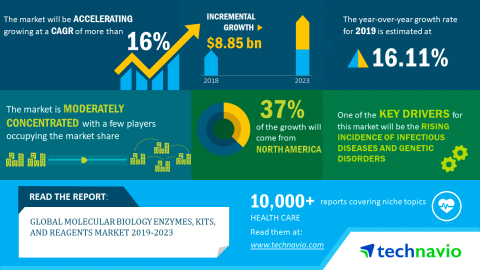 In this report, Technavio highlights the technological advances in the life sciences industry as one of the key emerging trends in the global molecular biology enzymes, kits, and reagents market. The surge in the number of chronic diseases globally has increased the need for technologically advanced personalized medicines. Researchers are modifying enzyme properties to create desired features. Such enzyme technology is also used in the pharmaceutical industry to develop drugs to cure various diseases. Technological advances like recombinant DNA technology require molecular biology enzymes, kits, and reagents for successful protein expression and cell extraction. Many such advances in the life sciences industry will increase the growth of the overall market. "Many vendors are offering molecular biology enzymes, kits, and reagents globally to support the demand. For example, Lucigen is offering products like cloning kits and vectors, modifying enzymes, and reverse transcriptase enzymes. New England Biolabs is also offering a comprehensive menu of reagents for use in DNA sample preparation, RNA sample preparation, and PCR applications. The increasing advances among several other vendors will drive the growth of the market during the forecast period," says an analyst at Technavio. This market report segments the global molecular biology enzymes, kits, and reagents market by end-user (biotechnology and pharmaceutical companies, hospitals and diagnostic centers, and academic institutes and research organizations) and geography (Asia, Europe, North America, and ROW). North America led the market in 2018 with a market share of more than 39%, followed by Europe, Asia, and ROW respectively. The dominance of North America can be attributed to the presence of many vendors that offer molecular biology enzymes, kits, and reagents in the region.